Shaving Cream Paint Technique, originally uploaded by DianthusMoon. A few weeks ago, a lady sent me a piece of paper that she said she had used ‘the shaving cream technique’ on. It was pretty and I wondered what she meant. Last week during a Live craft share on Facebook, one of the crafters showed us how to do it-so easy! You take some shaving cream, spread it either on a paper plate or in an aluminum pan (like an inch) and then add acrylic paint to. 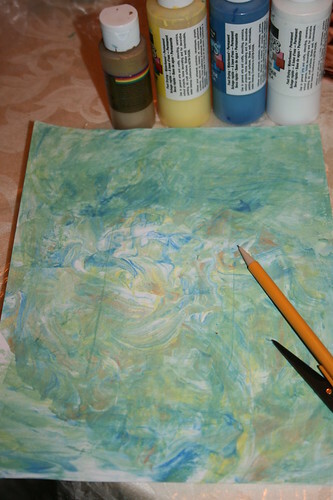 You squirt the paint on and swirl it around to make it interesting. I took some card stock and pressed it in the mixture. You then take an old credit card and scrap off the residue. I had some white spots, so I used the cc to add some more mixture and scrap it off again. I got some interesting designs and some looked like certain things to me-like the ‘mountain range’ the eagle is flying over and the island mountain. 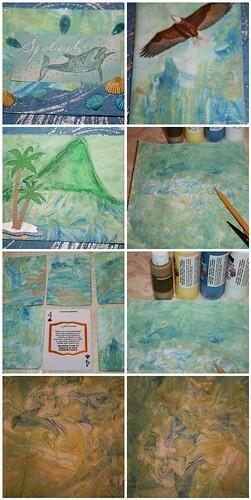 The triangle mountain shape was there and I colored it in with pastels and added a palm tree sticker. I plan to do this often-fun and relaxing! 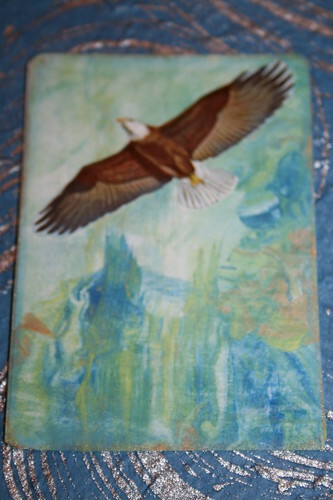 I cut mine to ATC size, but you could make greeting card backgrounds, etc. Here’s a detailed step-by-step here. What a pretty effect, Dianne!! How cool is that? I love the colors in the paper you made!